My friends know I enjoy decorating cakes. I’m by no means a professional, but it’s something I enjoy doing. It allows me to be creative and spend some quiet time with my Daddy God. 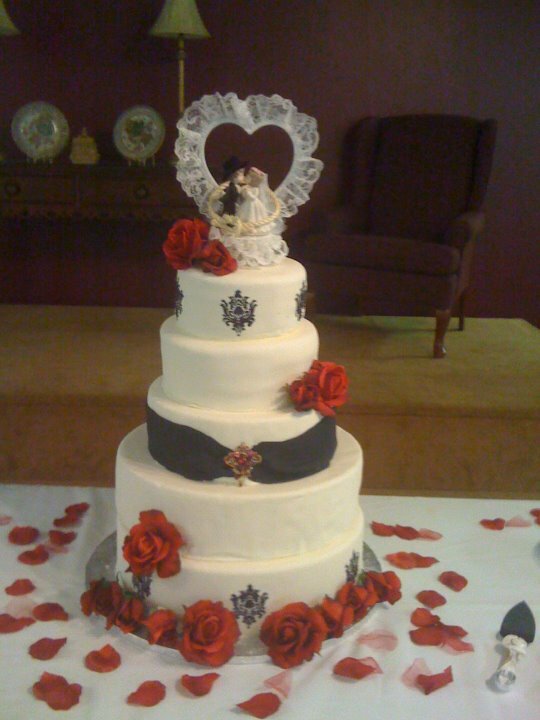 I was excited when my sister-in-law asked me to do her wedding cake, but as the day drew closer I began to get nervous. It was her wedding cake, so it had to be perfect. I also started getting nervous because the wedding was a few hours away, so I literally packed up anything I might use for a cake and drove it along with my family to the destination. I was relieved to hear that the church was allowing me to use their kitchen since there wasn’t really a way for me to decorate a 5 tier wedding cake in our hotel room. We arrived at the church to unload on Thursday evening, and I was so excited to see the kind of kitchen I would be working in. It was huge with more counter space than I could possibly need. There was almost anything on hand that I might need, so I was immediately thankful. Then, they told me that the air conditioner didn’t work in there, and I got very nervous. If you’ve ever made a cake, you can understand why my heart started racing. The cake was supposed to be buttercream, and I had made A LOT of buttercream beforehand. For those who don’t know, buttercream is so named because its primary ingredient is . . . butter. Our outside temperatures have been around 105-110 during the past month, so no air plus buttercream equals disaster! I decided to drop everything off and wait until Friday morning to get started. As I worked Friday morning, my spirit wasn’t quite as joyful as usual as I watched my buttercream literally melt off of the cake and onto the floor. I didn’t know what to do. ideal working environment, but it worked. I could feel the joy coming back as I saw my creation come together. I stacked all 5 tiers and stepped back to give God a little high 5 for his help in that situation. However, as I decorated the cake, it continued to lean more and more until it was so close to falling over. Some of the tiers had already cracked, and I was fighting back tears. It was still just too hot. I gave up for the day and I had no idea what was going to happen with this cake. All I knew was that it was not something a bride would be proud to display at her reception. Luckily with the help of facebook and some knowledgeable cake decorating friends, I worked in the hotel to create the cake that was very similar to what I had envisioned. I set it up on the bride’s table and placed the finishing touches on it. I stepped back with a smile because it was beautiful. Then, I felt like God was reminding me of Ecclesiastes 3:11. I know it sounds strange using this verse to talk about a cake, but that cake was far from beautiful the night before the wedding. By the time I had finished, it was something that the bride loved. It was beautiful! Sweet friend, I hope you understand that God has made everything beautiful in its time. If you’re going through days where you just don’t feel beautiful, spend time with God telling him that you don’t feel like the beautiful creation he says you are. So often we think we can’t be honest with God, but he is the one you can be the most honest with. He already knows, so why not confide in him those doubts the enemy is placing in your head? Stop and listen to him as he reveals to you your true beauty. Remember it’s not the world that sets the standard. It’s the creator of the universe and of everything beautiful. He knows better than anyone what beautiful is. After you talk with him and hear his words, step back and realize that you are beautiful. In the words of Lisa Bevere, you are stunning! Don’t believe anything that says different. Wow that looks great! Thanks for sharing such a wonderful sucess story.